The problem is that government is held to be truthful until caught in an undeniable falsehood. You appear to have come upon one or two here, lies used to justify depriving an individual of the due process of testing the evidence against him. What is the penalty for ordering the death of a man based upon what were probably understood at the time to be untruths? The penalty to the perpetrator of the killing and the supplier of its false justification? The background here is that Congress originally wrote the Geneva Convention common articles into law, as required. Then after the Hamdan decision CIA made Congress revoke that and decriminalize suspension of the right to trial. CIA put on their special spy goggles and read the invisible ink in the Geneva Convention that says, when you need to kill somebody, OLC has to say Olly Olly Oxen Free and then it’s OK cause that’s due process. It’s still a war crime, of course, but at home you’re fine. Universal-jurisdiction crimes could be a problem in independent courts but the USA doesn’t have those because judges remember what happened to Robert Vance. at one point i this saga i recall mention being made of al-awlaki havig been a cia operative and then having turned to the al-q side. 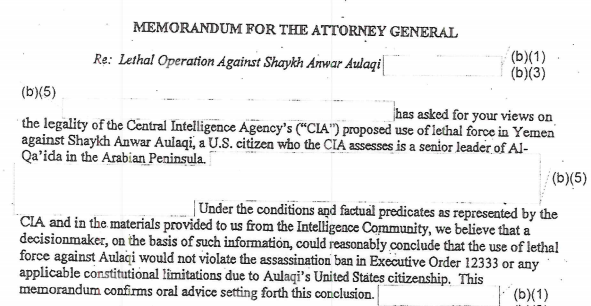 the implication would be that the cia killed al-a in revenge for being a “turncoat” – then killed his son to underscore the message to other cia operatives. this woud impy that cia lied to hig, nsc, obama, congress as part of a strategy of building a case justifying use of the presidetial authority to assassinate in order merely to take organizational revenge on al-awlaki. In 1947 Congress deliberately created the CIA to be a civilian-controlled intelligance agency that was NOT authorized to develop policy. To propose the use of lethal force is not providing information to “decisionmakers”, it’s the stark development of policy. The corruption of statutory intent has also included the false development, through torture, of (dis)information to justify such unconstitutional policy, further to be carried out by the unconstitutional militarized usurpation of decisionmaking by the CIA itself. This is elitist, fascist shadow-government at its worst, with no prospect of results other than inevitable, self-propagating, distastrous blowback.